Peter Higgins, oh what a fan you have made of me. After a surprisingly confident debut in Wolfhound Century, what do you do? You up the ante. Thank you. Truth and Fear is the delightfully confusing, beautifully written, immersive, and engaging second installment of his new series, The Wolfhound Century. And delightfully confusing is an understatement. Although he has largely shifted gears from the brilliance that was Part I of Wolfhound Century (see my review here), Higgins still keeps the story (now more of an adventure) as a slowly unfolding mystery, providing enough clues to keep the reader's rapt attention but still leaving much to the imagination. Many tantalizing questions remain close to mind: Just what in the world is Vissarion Lom, especially now that the slab of angel skin is no longer wedged in his forehead? What is the Pollandore, and what are its aims? And what are the aims of the newest protagonist (? ), the shapeshifter Antoninu Florian? Truth and Fear picks up right where the first installment leaves off. It begins with protagonists Vissarion Lom and Maroussia Shaumian on their way back into the capital of the Vlast, Mirgorod. Lom sees his primary duty as keeping Maroussia safe, and luckily he finds an ally in Antoninu Florian, a being with undisclosed aims of his own. And as Lom continues his desperate quest to keep Maroussia Shaumian safe, he also struggles to discover more about his own divided nature. The war with the Archipelago has changed Mirgorod, so the capital city Lom and Maroussia return to is not the one they left. The war, after all, is not going well for the Vlast, and the forces of the Archipelago are threatening the capital city. This suits Lavrentina Chazia just fine. She sees the baptismal fires of war as a unique opportunity to build a new, a purer, a stronger, and a united Vlast deep within the east, thousands of miles away. Chazia is convinced that the Pollandore is the route to her success, so she is willing to do anything to capture Maroussia Shaumian, who may in fact be the key to opening the Pollandore. The war also suits (primary antagonist) Josef Kantor just fine. It provides the perfect context in which he continues his quest to overthrow the existing social order and to create a new one, a harder future centered around him. And meanwhile, the Archangel is still struggling within the land, finding more and more freedom of movement to break free of its forest-prison. Higgins tells this tale with a crisp, engaging, and truly elegant prose. Perhaps the most poignant scenes are those tales of war come home. As the war comes to Mirgorod, predatory gangs and the dregs of society emerge in force. Meanwhile, Josef Kantor finds himself in a position to guide the defense of the city. And he seems to have taken a page out of the Soviet Union's World War II handbook. Citizens matter not. Death matters not. Instead, what matters is the city as idea. No sacrifice is too great to keep the idea of Mirgorod strong and alive. So the defense of Mirgorod at times feels like Gregory Zhukov's famous defense of Stalingrad in 1942, one that was highlighted by its blatant disregard for military and civilian casualties alike. Josef Kantor as general lights up the page, and I found myself wishing for more chapters from his perspective. The fates of all, however, are not tied to the war in Mirgorod. Instead, they are tied to a small town deep within the Vlast called Novoya Zima. It is within this town that the true future of the Vlast, of Chazia's dreams, or of Josef Kantor's empire, may be forged. 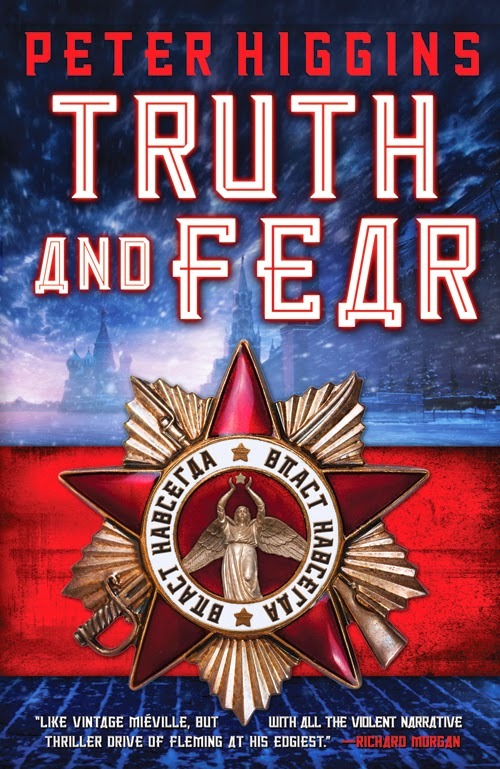 Supported by an authoritarian state, sporting the best minds of the Vlast, and engaged in top-secret research, Novoya Zima offers a perfect location for the climax of this fantastically fun read. The biggest weakness of Truth and Fear, however, was the rather feeble antagonist, Chazia. Granted, she was never set up as the main antagonist of the series. That honor goes to Josef Kantor, a man who might possibly be more Stalinist than Stalin himself. And Higgins does a wonderful job of showing how Chazia's obsession with angel skin has slowly been driving her insane. But given the fact that this book pit Vissarion Lom and his wits against an increasingly insane Chazia and hers, she ended up seeming overly weak willed and frail. Hardly an antagonist that could make the reader sit on the edge of his/her seat. And this was despite the fact that her insanity and possible unpredictability could have made her a literary force with which to be reckoned. Instead of anxiously waiting for the denouement of the Chazia storyline, I found myself waiting for Josef Kantor to come back on stage. This does not detract in any way from the story. Simply put, Truth and Fear is a fantastic continuation of Higgins's debut series. If his series gets any better, I might just morph into a stalking superfan. Bonuses: +1 for capturing the spirit of World War II-era Stalinist Russia.